And we’re having a music party, as well. Martin Roth and I will be making noises with Android; I hope to show in a couple of minutes why taking Pd mobile could be a powerful option for musicians. Also in the lineup, some fantastic Swedish artists: Anders Ilar (Pinesky), Pavan, (Flogsta Dancehall), and my own favorite, Håkan Lidbo (Container/P2 Ström). Flyer below. 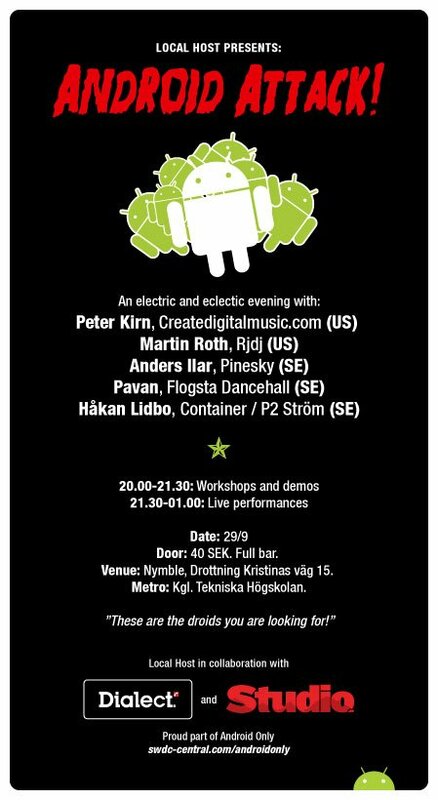 For those of you music hardware and software developers in Stockholm – you know who you are – hope you can make it out. (See also: Facebook.) It’s open to all, not just Android Only conference attendees. Since the vast majority of you aren’t in Stockholm, I’ll try to bring as much of this to you as I can on Music and Motion by next week.